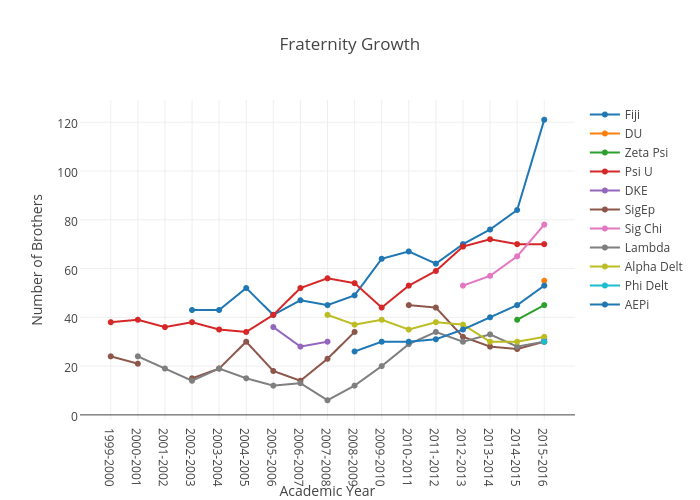 Juliettehainline's interactive graph and data of "Fraternity Growth" is a scatter chart, showing Fiji, DU, Zeta Psi, Psi U, DKE, SigEp, Sig Chi, Lambda, Alpha Delt, Phi Delt, AEPi; with Academic Year in the x-axis and Number of Brothers in the y-axis.. The x-axis shows values from -1.0825363088912507 to 17.08253630889125. The y-axis shows values from -1.6545166402535667 to 128.65451664025358.